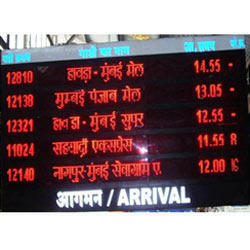 Pioneers in the industry, we offer railway display systems from India. We hold expertise in manufacturing, supplying, trading and exporting qualitative Railway Display Systems. Our range of display systems is used in the passenger information systems, full color coach guidance and train indication displays, video displays and master slave clocks as per RDSO standards. Also, we customize these systems as per clients’ demands. Looking for Railway Display Systems ?